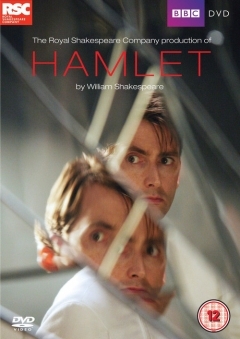 Based on its reputation, I was expecting to like the 2009 Royal Shakespeare Company production of Hamlet, directed by Gregory Doran and starring David Tennant, much better than I did. Every Hamlet rises or falls on the performance of the title-role actor, and Tennant had both strengths and problems. He has the perfect look for the part, and he nailed the Danish prince’s anxiety and snark. But when it came to exploring Hamlet’s anguish and rage, he fell back on acting BIGGER and LOUDER. As I result, I don’t think Tennant connected with full emotion to the part, so I didn’t feel much emotion watching him. Another problematic performance was Patrick Stewart’s Claudius. I liked his wise and even-tempered reading; however, Stewart’s usurper was so amiable that he failed to convince me he could kick a dog much less kill his brother, seduce his brother’s wife, and plot the treacherous murder of their son. On the plus side, the women of the play were pretty good. Mariah Gale’s Ophelia was strong and self-possessed, even in madness where she was more angry than wounded. (Jean Simmons’ guppy out of water reading of Ophelia in Olivier’s movie version was a low point of Hamlet on film.) Penny Downie’s Gertrude was quite good, too, except for the Act IV bedroom scene with Tennant, when she seem to fight his big and loud with her own big and loud. Also on the plus side, Doran’s Hamlet is funny. He seizes every opportunity the play allows to read lines as comic. This means Polonius really takes it on the chin, although I also enjoyed the utter bafflement Tom Davey’s Guildenstern projected whenever the dialogue didn’t require him to reveal a faint glimmer of understanding. (He gave Osric a run for his money. ) Good fun too were the expressions of impatience, disbelief, credulity, and exasperation the actors wore whenever anyone, not just Polonius, made a long speech. All the joking diminished the tragic punch of the staging, however. Now, my quibbles. I have no idea in what time period this Hamlet was meant to be set. Tennant was the complete modern hipster. Horatio dressed like a middle-aged academic circa 1982. Claudius and Gertrude had the air of a rich mid-20th century power couple. Polonius resembled an Elizabethan courtier on dress-down day. Different soldiers carried weapons from vastly different centuries. If there was a point to all this variety, I missed it. Finally, Doran cut roughly seven lines from “To be, or not to be”. God knows there are vast tracks of Shakespeare – particularly in the history plays – which can be given the boot to everyone’s benefit, but editing Hamlet’s most famous speech accomplishes nothing beyond gratuitous shock value. On my Hamlet list, I’d put the Tennant version right above Ethan Hawke’s. See my list of best Hamlet movies. Interesting view. I liked Stewart’s Claudius because he showed the human side of the villain – a man who really isn’t such a bad sort until his lust for power induces him to commit horrible crimes. Just last night, I saw an interview with a serial killer who described himself a “Not a monster, just a human being who made a few mistakes.” I think Stewart played Claudius that way: a man who doesn’t see himself as any different from the rest of us, he just made a few mistakes. I agree with your assessment of Tennant. He put a little too much manic energy into the role, and I thought the soliloquy was flat. And that outfit just ruined everything. My view of Ophelia was completely opposite of yours. I thought she was one of the worst I’d ever seen, and the main problem came from her attempts to out-shout Tennant. Since the character of Hamlet is supposed to leave the audience wondering whether he’s truly mad or faking it – and if he’s faking any of his madness, how much? – it makes sense to me that he might overdo it. In contrast, there’s no doubt about Ophelia’s madness, so I feel it should be underplayed, if anything. (Maybe that’s my background in psychology speaking, since so often families of suicides don’t see the signs until too late.) I really think one of the two should have toned things down a bit, and I prefer my Ophelia to be a little more wan and suffering. Thanks for a thoughtful assessment, that gave me a different perspective. And thank you for your perspectives! My tastes in Ophelias and Gertrudes run toward strength. There aren’t many women in the play, and when the production emphasizes their weaknesses, it bothers me. You are right about Ophelia needing to outshout Tennant. 3.1 did not work for me at all. But she did a nice job rolling her eyes at Laertes in the first act, and I like how Ophelia was both self-possessed and a little overwhelmed in her early audiences with the king and queen. I considered the Doctor a murderer, fundamentally, and I thought Christopher Eccleston really captured that backstory in his portrayal of the Doctor. He was properly angry and tortured and bitter and so on, while still being clever and enthusiastic. Tennant, on the other hand, did enthusiasm and humor enormously well, but when it came to being angry, it was just as you say: he just acted BIGGER and LOUDER. Interesting to see that he does this in other roles too. I haven’t seen Tennant in other roles (I’m old enough that my mental picture of Dr. Who remains Tom Baker … yes that old), but he wouldn’t be the first actor with both talent and a narrow range. It’s funny because I saw the original Tennant performance at Stratford and LOVED it but haven’t seen the film and have heard other pretty negative comments. Perhaps he had to ‘ham’ it up more for the big screen???? Yes, I don’t know. I have been thinking, while writing this review and a few other recent ones, about how you can say anything objective about emotional response. Watching the film, I asked myself on several occasions, “Is this not working or just not working for me?” There are things Tennant did well. I really liked him in 1.2 and he was excellently sniffy before the ghost appears on the platform. And when anyone was trying to be funny, they were consistently funny, without mugging for the audience. I envy your live Stratford experience. Peter, your analysis never disappoints me! Hamlet is one of my favourite books. I remember being obsessed with it for years, agonising over its many scenes. Thanks. I don’t think Shakespeare’s poetry is sacred text, by any means. I like Baz Luhrmann’s “Romeo & Juliet” and he cut 90+% of the text. Branagh cut a good chunk of the St. Crispin’s Day speech in his “Henry V” and I think it made it stronger, since Will had the young king repeating himself, in my opinion. But the cuts to “To be, or not to be” in this version just seem like a stunt to me. Especially since the cut lines are a nice summary of everything making Hamlet miserable at that moment. I’m hoping to find a DVD version of Jude Law’s Broadway performance. The YouTube snippets are delicious. I’ve been hoping to lay hands on Simon Russel Beale’s performance, but as far as I know, film doesn’t exist. Very interesting to pull out different pieces from different performances. My high school teacher had “Hamlet” comic books, mostly to give us a quick intro to the story. I haven’t seen Beale either but I’ve seen discussions, and I thought he was a really good Falstaff because Beale really let Fat Jack’s seamy underside show through. I think my original idea for the movie post was to compare all the 2BN2Bs, then I decided little capsule blurbs would be more useful, to both Hamlet veterans and newcomers. Very cool comparisons, though! I am embarrassed to say that Tennant’s Hamlet was the first I have ever watched. I have never really been interested in Shakespeare, even though I love to read and have read many of the classics. Recently, my son played Petruchio in his high school play and I found it much more enjoyable than the horrid reading of Romeo and Juliet and Macbeth my high school honors English teacher put us through. When I found out that Tennant had played Hamlet, I figured what the heck — I liked him as Dr. Who. I really enjoyed his Hamlet. It seemed to me that he played Hamlet as truly mad. I even googled to see if Tennant had ever been diagnosed with bipolar disorder — no he has not. Someone posted earlier that he had too much maniacal energy. Well that is what madness is — you are too happy, too sad, too quiet, too talkative, too loud, too much in love, too angry, too grabby, too needy, too funny, always, always too much — which really, really annoys people. I have since watched Cumberbatch in Hamlet. I love Benedict Cumberbatch, but I thought much of his Hamlet was silly. Dressing up as a toy soldier? That’s not madness that is a normal person trying to act as if they are mad and getting it all wrong. I guess if that is what he was going for — he got it right. And I am aware that some actor’s play Hamlet as faking madness and some play him as really mad, but a toy soldier clumping around on a table? At least if you are play acting mad, have the toy soldier moving faster and shooting at things. Cumberbatch’s Ophelia — she seemed as if she was having a psychotic break. She was very good. And getting rid of her camera and photos — exactly what some do before a suicide attempt. A positive outcome from two such popular actors playing Hamlet, is that both Cumberbatch and Tennant have introduced many more people to Hamlet and Shakespeare. Since watching Tennant’s Hamlet, I have watched Much Ado About Nothing and listened to The Comedy of Errors and Twelfth Night. Next on the agenda is Branagh’s Hamlet. Thanks for the lovely long comment, Kim! I certainly agree with your comments about Tennant and Cumberbatch bring new audiences for Will. When I caught up with the grumbling over the pop culture excitement surrounding Cumberbatch playing Hamlet, I grumbled myself. There is an elite that wants to keep Shakespeare elite so they can feel different and special and better than the “average” person. Me, the more people who find their way to art – no matter how they find their way – the better! David Tennant played a character with bipolar disorder (then called manic depression) in a 90s TV series called Takin’ Over the Asylum. I’m sure he learned a lot about the condition and how to portray it during that time, which may have influenced his portrayal of Hamlet. I know this reply is years late, but I thought you might be interested since you were googling whether he had been diagnosed with it. I actually have watched Takin it to the Asylum. I can’t remember if I watched it before or after I watched Hamlet. Tennant was excellent in that too and I can see how he might have learned about mania by playing someone with bipolar disorder. As a side note, I think I will be watching much more Shakespeare in the future. My youngest son was accepted to a Theater Arts High School and is playing Mercutio in Romeo and Juliet. He is just a sophomore and he was the only one in his class to get a major part in one of the three plays/musicals the school is producing this year. A little bit of boasting, but I’m proud and a little amazed at his talent. He was up against several upper class men for the part and we kept telling him that, since he was a sophomore and just transferred to the school, that it was unlikely that he would actually get it. Anyway, I’m sure I will be learning all about different Shakespeare characters in the next few years.